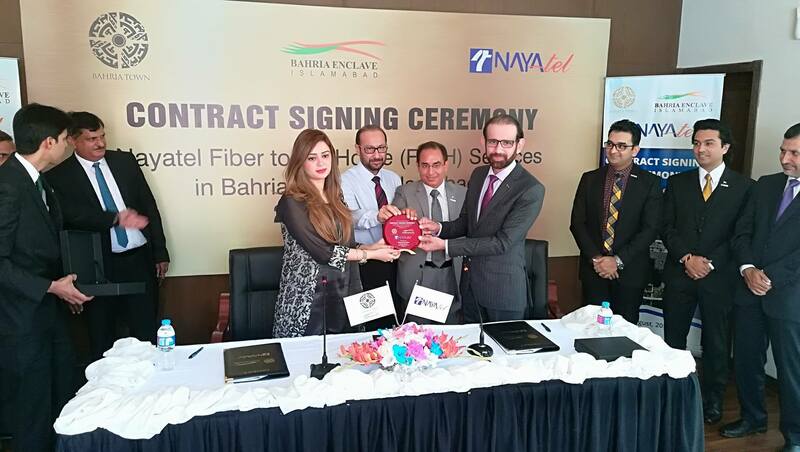 Bahria Town’s premium project in Islamabad – Bahria Enclave – has signed a landmark deal with Nayatel, the pioneer of Fibre To The Home (FTTH) services in South Asia and providing internet, cable tv and telephone services in Islamabad, Rawalpindi and Faisalabad. Under this arrangement, Nayatel would turn Bahria Enclave into a Smart City. During a contract signing ceremony, held at Bahria Enclave Office on Tuesday, Islamabad Bahria Enclave Executive Director Saira Pervaiz Khan and Nayatel CEO Wahajus Siraj formally signed the agreement. The ceremony was attended by top management and marketing teams of Bahria Enclave and Nayatel. Siraj highlighted the objective of turning Pakistan into a technologically advanced country with the aim of taking Nayatel nationwide. He termed the deal with Bahria Town as a big milestone in this connection. In his speech, he assured the audience that Nayatel is contributing its bit towards making Pakistan modern.